Back in the city centre and we visited the Dog & Doublet before finishing at the Lych Gate Tavern. I reviewed the latter earlier this year. So I won't review that again. 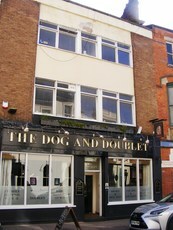 But the Dog & Doublet was very good too. It was quieter than I had anticipated when we walked in, with only one row of people at the bar. But by the time we left, it was 5/6 deep. Given the place is not that big, it had got fairly crowded. The ale range was decent. Ludlow Gold is the regular ale. Guests were Oakham Citra, Rat Atella Milk Chocolate & Hazelnut Stout, Kelham Island Pale Rider, Wood's Lass & Abbeydale Moonshine. The cider was Gwynt y Ddraig Black Dragon. Probably the best place we went to for beers on this trip to Wolverhampton. But I marginally preferred Hail To The Ale, by virtue of its ciders. Offers a CAMRA discount. I'll definitely be back here some time soon. Enjoyed a decent pint of Sarah Hughes Dark Ruby Mild. Nothing special about the pub itself. 6/10. Seeing Rob Beckett at the Wulfrun Hall, I checked the Good Beer Guide to see what Wolverhampton had to offer. 14 Entries! Modern Looking Pub from the exterior - four real ales and I went for a decent Oakhams Bishops Farewell. As the other reviewers have said this pub is a good `un, essential visit when in Wolvo. The last (or the first) in a line of four handy pubs within a 12 minute dog leg trail from or towards Wolverhampton train station. The D & D is fast becoming my favourite, being the cheapest, friendliest, stylish and the most enterprising. In my book a range of 6 - 8 ales is enough for anyone and the young staff always seem eager to help you with your choice. There's also a great work ethic evident in maintaining the high standard in ale quality - this is a genuinely customer focused pub. Best avoided on home match days if you're not a Dingle, but that aside my half a dozen visits have been more than satisfying. Hopefully this will provide a little bit of a kick up the jacksie to its three nearest competitors that have tended to rest on their laurels of late. I'll award an 8.5/10 but what the hell, lets push it up to 9.